I so enjoyed the earliest homemade anime and animated videos I found on YouTube back in the early Twenty-tens! 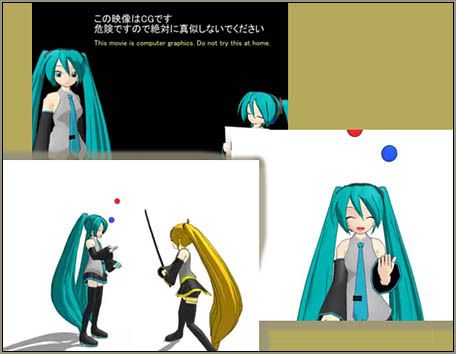 My personal journey to loving Miku and MikuMikuDance got it’s start in about that year… 2010. 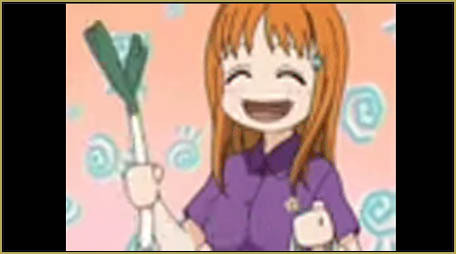 By that time I had been an Anime fan for over 15 years… had seen home computers mature… and then I discovered that you could create animation, yourself, on your own computer. 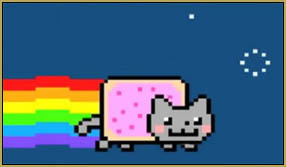 Nyan Cat was one of the first stupid video memes that I latched onto! Just a crazy song and that simple repetitive animation. The first one I saw was like two-an-a-half minutes… but I have seen that a TEN-HOUR version is available… and there may be longer ones than that! 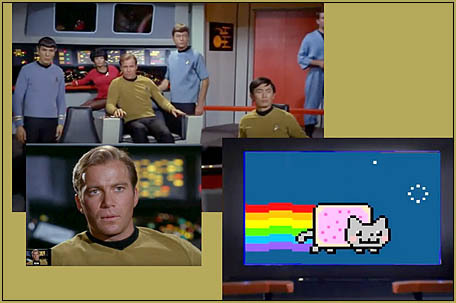 Nyan Cat was so annoying… that Kirk blasted it away! Another crazy meme was the Leekspin video. THAT crazy video started a meme fad that lasted for years… and it features the music: The Ievan Polkka… also misspelled as the Levan Polkka because the cap I looks like a lowercase L. That MUSIC is amazing and is a meme, by itself! Search YouTube and see the many iterations of that song… and of the leekspin… the leekspin polkka! and “deformed” versions of Miku! Too funny! That animation is just a fun little thing! Fun to watch. 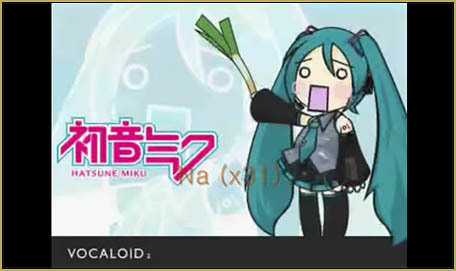 … and then in early 2011, while enjoying the search for leekspin videos, I found, I discovered the wonderful Miku animation featuring the beautiful Miku of project Diva… and, again, the Ievan Polkka! 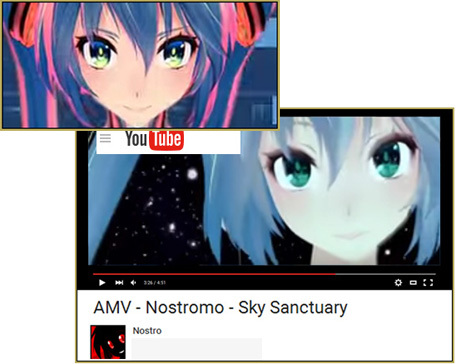 She was so awesome… and started me thinking that people were creating these beautiful videos on their home computers… YES, professional Vocaloid videos were online… but I could also find homemade videos, too… HOW were they doing it?… what software were they using? 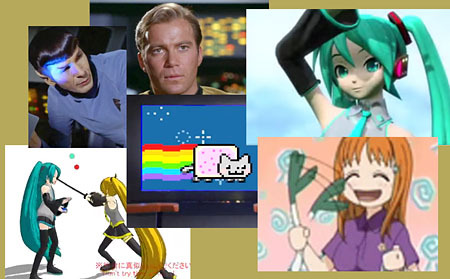 … and I discovered MikuMikuDance! 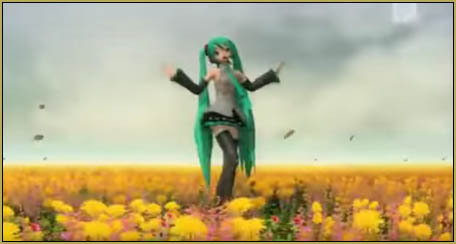 Now I was on a mission… to learn MikuMikuDance… to watch videos created by the experts… they were all Japanese at that time… I couldn’t get enough! CLICK on each picture to see the related video… and then click on the YouTuber’s name to see the YouTube account of each of those artists… a HUGE body of work is there! Fun… Neru gets so angry… and watch for the unicycle in the closing credits! Awesome work in this piece! 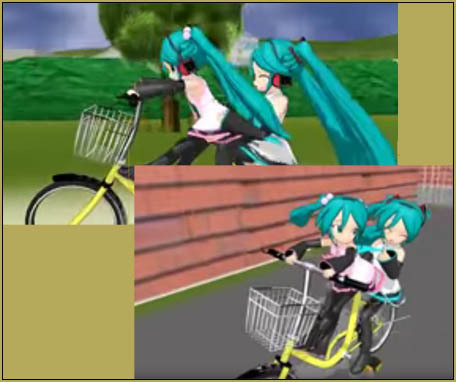 Wonderful animation/drama as the Miku’s ride their bike across a huge city with plenty of close-calls along the way! I can watch it over and over! … be sure to see his other videos… MANY of them! 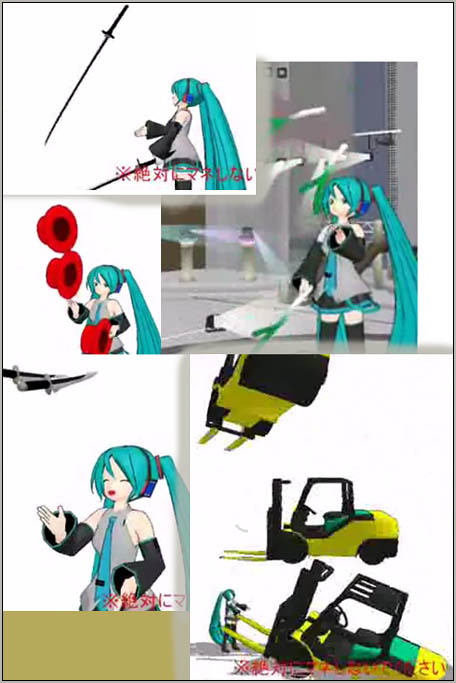 Miku Juggles… leeks, knives, swords, lift-trucks, an entire stage. … Nothing in the digital-world weighs anything! 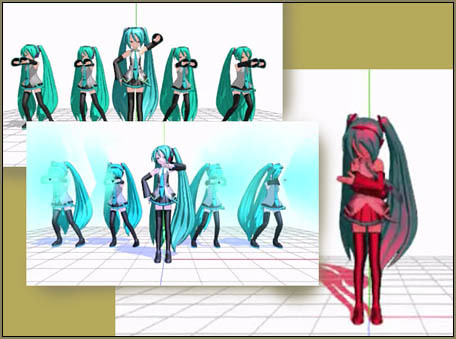 MikuMikuDance 7.39 materialized in July of 2010… the lid was off!… the world suddenly had access to Miku and MikuMikuDance! … and the fun we had with it! 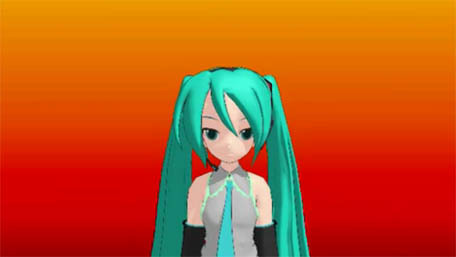 MMD beginners began having some fun with Miku… a new world was opening! Note how the explosions happen off-stage… but we experience them through the shaking camera and the colored lights… very creative! “Didn’t see THAT one coming, did ya?” … too funny! I was hooked! I have been running MMD, now, since about July of 2011. My inspiration has always been those simple, early MMD videos… like those juggling animations and that Mikus Attack animation. … but there is so much more! I discovered THIS video a couple of years ago… it is simply stunning with its image quality, effects, and post-production editing. It seems to be a collection of MANY short clips; all rolled together into an MMD masterpiece. That finished product is such a masterpiece… it kind of knocks the wind out of my sails as I contemplate a new MMD project. Full Circle… MMD from early to now! Leave comments, below, to share YOUR favorite old MMD animations… what got YOU hooked?